Hossenfelder notes that there have been numerous instances in the past when scientists’ over-reliance on “beauty” has led it astray. Newton’s clockwork universe, with seemingly self-evident laws of motion and gravity operating on an unchanging grid of space and time, seemed just too natural and beautiful to ever be doubted. Sadly, this mindset retarded acceptance of relativity and quantum mechanics for decades. Even quantum mechanics has its detractors, because much of it seems so counterintuitive. To this day, many physicists believe that there must be some more “reasonable” underlying theory. Yet even the most exacting recent tests continue to precisely confirm the predictions of quantum theory. Hossenfelder argues that too many physicists today, like their counterparts of previous eras, cling to theories that have been seemingly rejected by experimental evidence, or which have extrapolated far beyond what can be reasonably expected to be tested by experimentation in any foreseeable time frame. The usual reason that researchers stick by these theories is that the mathematical techniques behind them are judged “too beautiful not to be true,” or for some other largely aesthetic (and thus unscientific) reason. Supersymmetry is the notion that each particle has a “superpartner.” Supersymmetry was proposed in the 1970s to complete the collection of known particles. It is appealing to many physicists because it explains how the two known types of particles, fermions and bosons, belong together — supersymmetry proposes that the laws of nature remain unchanged when fermions are exchanged with bosons. More recently, supersymmetry has been proposed to explain why the Higgs boson has the mass it has. Hossenfelder notes that thousands of her colleagues have bet their careers on it. But no such superparticles have ever been found, even in the latest high-energy experiments on the Large Hadron Collider. Undeterred, many physicists just “know” supersymmetry must be true and continue to pursue it. String theory is the notion that all of physical reality is derived from the harmonic properties of exceedingly small strings and higher-dimensional “branes,” and that reality is really 10- or 11-dimensional, with extra dimensions curled up into submicroscopically small configurations, much like a hose that appears one-dimensional from a distance but admits travel around its circular cross-section at close quarters. String theory has been proposed as the long-sought “theory of everything,” because it appears to unite relativity and quantum theory, but mostly because it is so “beautiful.” Yet in spite of decades of effort, by literally thousands of brilliant mathematical physicists, the field has yet to produce any specific experimentally testable prediction or test, short of hypothesizing galaxy-sized accelerators. What’s more, hopes that string theory would result in a single crisp physical theory, pinning down unique laws and unique values of the fundamental constants, have been dashed. Instead, the theory admits a huge number of different options, corresponding to different Calabi-Yau spaces, which by one reckoning number more than 10500. The multiverse is the notion that ultimate reality consist of a huge and possibly infinite collection of other universes (see previous item, for instance), each forever separate and incommunicado from our own universe. The multiverse arose out of attempts to explain the apparent fine tuning of the laws and constants of physics. Researchers explain fine tuning by saying, in effect, that if our particular universe were not fine-tuned pretty much as we presently see it, we could not exist and thus would not be here to talk about it; end of story. But many other scientists consider this type of “anthropic principle” argument highly controversial, an abdication of empirically testable physics. Is this really the best explanation that the field can produce? The hidden rules served us badly. Even though we proposed an abundance of new natural laws, they all remained unconfirmed. And while I witnessed my profession slip into crisis, I slipped into my own personal crisis. I’m not sure anymore that what we do here, in the foundations of physics, is science. And if not, then why am I wasting my time with it? I doubt my sense of beauty is a reliable guide to uncovering fundamental laws of nature, laws that dictate the behavior of entities that I have no direct sensory awareness of, never had, and never will have. For it to be hardwired into my brain, it ought to have been beneficial during natural selection. But what evolutionary advantage has there ever been to understanding quantum gravity? It’s true that in most other parts of science what’s needed to check whether ideas are right or wrong are new experiments. But our field is so mature that we get incredible constraints already by old experiments. The constraints are so strong that they rule out pretty much everything you can try. If you are an honest physicist, 99.99 percent of your ideas, even good ideas, are going to be ruled out, not by new experiments but already by inconsistency with old experiments. However, Hossenfelder notes that one can never prove any mathematics to be a true description of nature, because in the end mathematics only encapsulates provable truths about mathematical structures. The claim that these structures correspond to physical reality is a separate assertion that must always be tested and confirmed by experiment. Our sense of beauty has changed. And … the beauty that we seek now, not in art, not in home decoration — or in horse breeding — but the beauty we seek in physical theories is a beauty of rigidity. We would like theories that to the greatest extent possible could not be varied without leading to impossibilities, like mathematical inconsistencies. 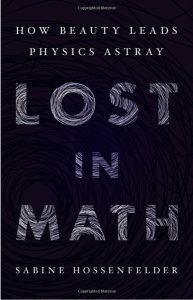 As before, Hossenfelder counters that mathematical consistency is a fairly weak requirement: “There are many things that are mathematically consistent that have nothing to do with the [real] world.” Weinberg acknowledges this point, but still hopes that we can find a theory that is unique, in the sense that is the only mathematically consistent theory that is sufficiently rich to permit diverse phenomena, including life. Hossenfelder can see the appeal of such a theory, but doesn’t see how naturalness or mathematical beauty can be a useful guide. Weinberg also commented on the foundations of quantum mechanics. Weinberg acknowledged that we really don’t have any satisfactory theory of quantum mechanics. But Weinberg is largely content with the “shut up and calculate” approach to these problems — quantum mechanics may seem ugly and “unnatural,” but it works. I guess the most serious candidate for a better theory — better in the sense of bringing together gravity with the other interactions in an i intimate way and solving the [problem with quantum gravity] — is string theory. [But] to me it’s not clear what the theory is. It’s kind of a miasma of ideas that hasn’t yet taken shape, and it’s too early to say whether it’s simple or not — or even if it’s right or not. Right now it definitely doesn’t appear simple. One final interesting commentary in the book is where Hossenfelder outlines some of the changes that have happened to the scientific enterprise over the past few decades. For one thing, there are many more physicists than in the past. The number of new physics PhDs in the U.S. has increased from about 20 per year in 1900 to over 2000 per year in 2012. Since 1970, the total number of papers in the physics field has increased by about 3.8 to 4.0% per year, i.e., a doubling time of about 18 years. And as the size of the physics literature has grown, it has bifurcated into numerous separate subfields, most of which are too specialized to be easily read by physicists outside the subdiscipline. Further, the number of authors on a typical physics paper has increased, as has the number of publications for a single physicist — i.e., publish or perish. Many physicists spend an increasing amount of time writing proposals, and fewer than ever are employed in solid, tenured positions, resulting in increased stress and less time to do real research. Given these trends, it is perhaps not surprising that younger physicists quickly gravitate to well-worn paths, rather than aggressively challenging established orthodoxy. In spite of Hossenfelder’s angst, she ends the book on a positive note. She recognizes that the laws of nature as we presently understand them are incomplete, and to produce a truly unified theory researchers will need to overhaul either general relativity or quantum physics or both. Some say that physics was the success story of the last century, but she is convinced that the next major breakthrough will happen in this century. “It will be beautiful,” whatever that will mean.